To assess the clinical benefits of transmural healing (TH) shown on intestinal ultrasound (IUS) after treatment with tumor necrosis factor-alpha antibodies (anti-TNF) in patients with Crohn’s disease. This prospective study included consecutively 36 patients who underwent IUS in the week prior to start anti-TNF treatment, at 12 weeks, and 1 year after starting treatment. 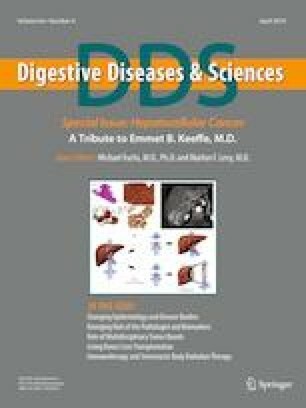 The clinical response to treatment was assessed using the Crohn’s disease activity index and C-reactive protein (CRP) values. TH was defined as the normalization of bowel wall thickness on IUS. Treated patients were considered to have a good outcome if none of the following situations presented: need to reintroduce corticosteroids or intensify maintenance therapy and/or need for surgery. After the induction regimen, 29 patients (80.6%) achieved clinical remission, and serum CRP values returned to normal in 20 patients (55.6%). In the IUS at 12 weeks, treatment induced a statistically significant reduction in the wall thickness (p < 0.001) and color Doppler grade (p < 0.001), as well as resolution of complications in 66.7% of patients (p < 0.03). IUS after 1 year of biological therapy showed TH in 14/33 patients (42.4%). During the follow-up (median 48.5 months), 23 of the 33 (69.7%) patients in remission or response after induction therapy presented a good outcome. Sonographic TH was significantly related with better outcomes, with only 1/14 patients having a poor outcome compared to 9/19 without TH (OR 11.7, 95% CI 1.2–108.2 p = 0.01, Chi-squared test). Patients who achieve TH on IUS with biological treatment have better clinical outcomes. The approval of our center’s Ethics Committee was obtained in order to conduct of the study (ECRAYM 2008). Prior to their inclusion in the study, patients were informed of its nature and gave their written consent.